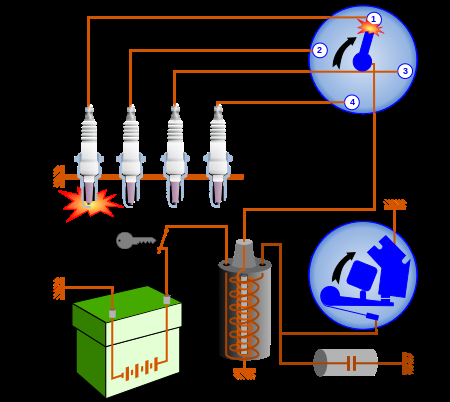 In automobile engineering, Petrol Engine uses electric spark ignition to ignite the fuel mixture. The compressed air-petrol mixture in a petrol engine must be fired at the correct instant. So, that the resulting rise in pressure acts on the piston when it is at top dead center. 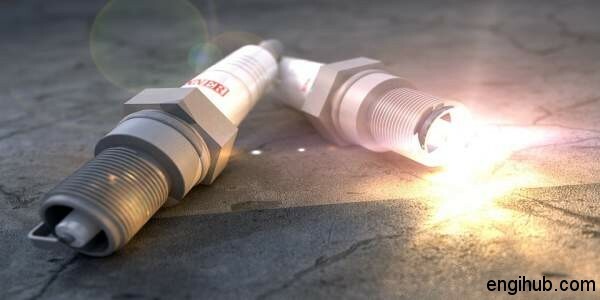 A high voltage is required to jump the gap between a spark plug and give a spark of sufficient energy to ignite the mixture. As the speed of a spark ignition engine increases, it is desirable that the spark advance increase as the ignition time stays constant but the cycle is completed in less time. Some devices are employed for this purpose. In this spark ignition mechanism, the drive shaft is connected to the ignition cam through the base plate, spring-loaded weight and an advance cam and latter integral with the ignition cam. When the speed of the engine increases, the centrifugal force pulls the weights out against the spring force thus advancing the angular position of the cam relative to drive shaft. This action opens the contact points earlier and the ignition timing is therefore advanced. With a decrease in the speed, the spring’s pulls the weight inwards and bring back the cam thus reducing the spark in advance. In this spark ignition, a flexible diaphragm is kept in the fully retarded position by the force of a spring. One face of the diaphragm is exposed to the atmosphere through the air vent; the other face is exposed to vacuum in the sealed vacuum chamber. This is connected by a pipeline to the induction manifold. The part loads due to vacuum the diaphragm is pushed upwards by the air pressure and the angular position of the cam in the distributor are advanced through the actuating rod so that the spark now occurs earlier. When the engine runs at full load, the suction in the manifold decreases. Hence the diaphragm is pushed downwards by the spring thereby retarding the cam. This way you can increase the timing of spark ignition in your petrol engine. Spark Plug: How to Construct Spark Plug of Automotive Engine?